Tower sculpture in Holstebro. 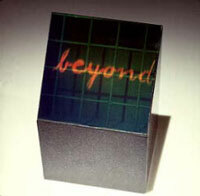 Laser-light, steel, concrete and white light projection through holographic gratings. 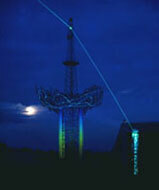 Tower sculpture in Billund. 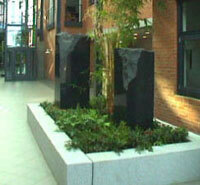 Granite, steel, water, fibre optics and white light projection through holographic gratings. Group of five sculptures at Agricultural Research Centre Flakkebjerg. Light sculpture. Granite, brass, fibre optics and white light projection through holographic gratings. 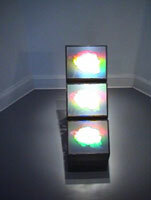 Hologram sculpture. Mirrorbacked rainbow holograms mounted on black granite. Reflection hologram mounted on black polished granite. 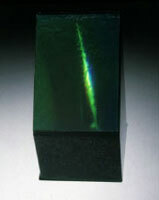 Object made of reflection hologram - showing a laserbeam - plexiglass and stones. 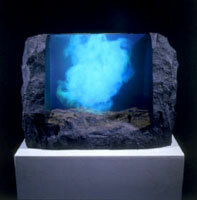 Hologram sculpture 1987-88. 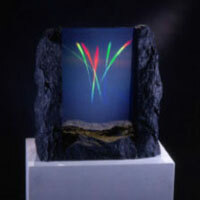 White light transmission hologram mounted in granite. 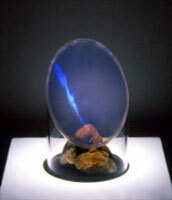 Object with Reflection hologram of Sand Hollow and a real stone. 1988.